Our guest writer is Laura Stewart Holder, who will be contributing from time to time on topics related to history tourism in the South. Laura works at the Center for Historic Preservation at MTSU and lives in Franklin, Tenn. with her husband and two young sons, as well as a very quiet cat. It just doesn’t feel like Christmas until the annual Dickens of a Christmas festivities commence along historic Franklin, Tennessee’s Main Street. The weather promises to be perfect for this glorious outdoor street fair, held this Saturday and Sunday. It’s the perfect excuse to leave the hustle and bustle of shopping and decorating (fun, but let’s face it, sometimes a little stressful) behind, and step back in time to the joyous celebrations of Victorian England. Free and open to the public, Dickens of a Christmas attracts thousands of visitors every year. Franklin’s beautifully restored downtown square makes the perfect backdrop for this merry festival, where hundreds of gorgeously costumed characters (including Father Christmas and old Ebenezer Scrooge himself) share their special brand of holiday cheer. Music, dancing, and Dickens-inspired revelry make this free street fair fun for adults and kids alike. The crafts bazaar, as well as downtown Franklin’s wonderful assortment of distinctive shops (most, thought not all, locally owned), offers great opportunities to find one-of-a-kind gifts. For a real holiday bargain, take a horse-drawn carriage ride around the historic square for just $2. And all sorts of tasty treats, from hot cider to real old-fashioned sugarplums, will be on hand to tempt your sweet tooth. Chase them down with a turkey leg, and you won’t feel guilty about all that lovely sugar. Sunday’s festivities wrap up with an especially delightful event – the Town Sing. Everyone is invited to gather around the Christmas Tree in the Public Square at 4:30 p.m. to carol down Main Street, finishing up at the Historic Presbyterian Church. As a self-confessed lover of all Christmas carols, I’ve been looking forward to this all year. Come as you are, or don your favorite Victorian finery if you’re feeling especially festive. Just be sure to be in Franklin this weekend. Merry Olde England at Christmastime awaits, just a few miles down the road. It’s the perfect break from the holiday rush, and a tradition that you and yours will want to keep every year. 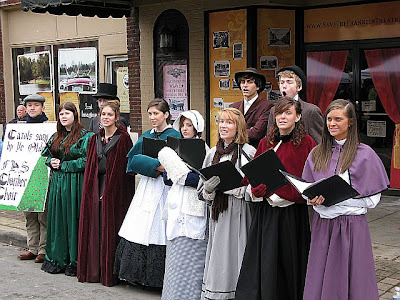 Presented by the Heritage Foundation of Franklin and Williamson County, this year’s Dickens of a Christmas will be held Dec. 8-9, 2012, 10 a.m. to 5 p.m. Saturday and noon to 5 p.m. Sunday. For more information, visit here.